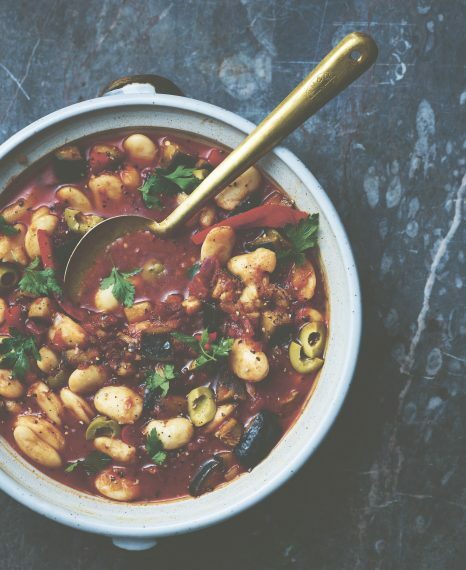 Aubergine soaks up the wonderful flavours of oregano and cinnamon in this moreish cassoulet. Serve straight to the table in its cooking pot for a simple, rustic meal. A true crowd-pleaser. Heat the olive oil in a large saucepan over a high heat, then add the aubergine, oregano, mixed herbs and cinnamon. Cook for 3 minutes, stirring frequently. Add the onion and red pepper, and cook for a further 2 minutes until the onion begins to soften. Pour in the chopped tomatoes, 150ml of water and ketchup, followed by the olives and butter beans. Scatter with the parsley and season with sea salt just before serving.